Some photographic exhibitions can be stingy and sparing in sharing the work of the artist. 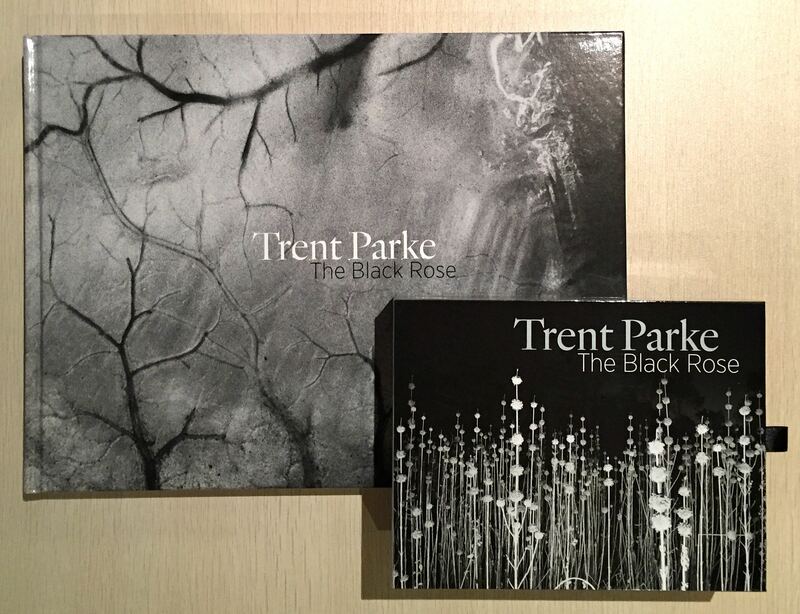 “The Black Rose” is a lush and luxurious experience of Trent Parke’s extensive body of work. As part of Adelaide Festival, the exhibition is described on the website. You can visit them on the web here. Parke’s work has a distinctive style. Mostly black and white, utilising high contrast images, often shot in low light or at night to enhance this effect. I have talked about one of my favourite Parke images back here. 1. Don’t be afraid of high contrast. There are significant portions of Parke’s images that have very little shadow detail. Parke often uses the negative space to direct the eye of the viewer to the feature, which is often bright and well lit. 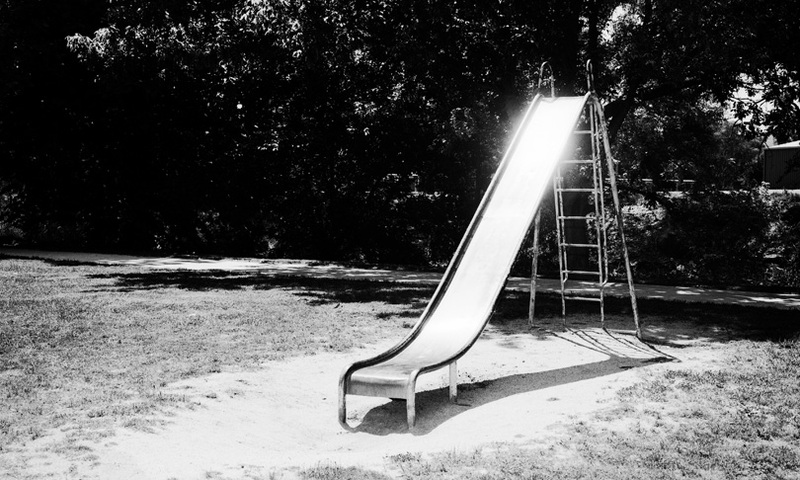 In the image of the slide, the detail is lost in the darkest spots of the image, in favour of the highlight at the top of the slide. This a recurring technique throughout the exhibition. 2. Get to know and love your flash. Many of the images used flash judiciously to deliver contrast in the image. Some of my favourite images leveraged the use of the artificial shadows produced by the flash which I so often try to avoid. Parke often uses his flash to throw shadows purposefully and to produce edge lit images. Many of his images of the beach end up looking like lunar landscapes rather than earth. 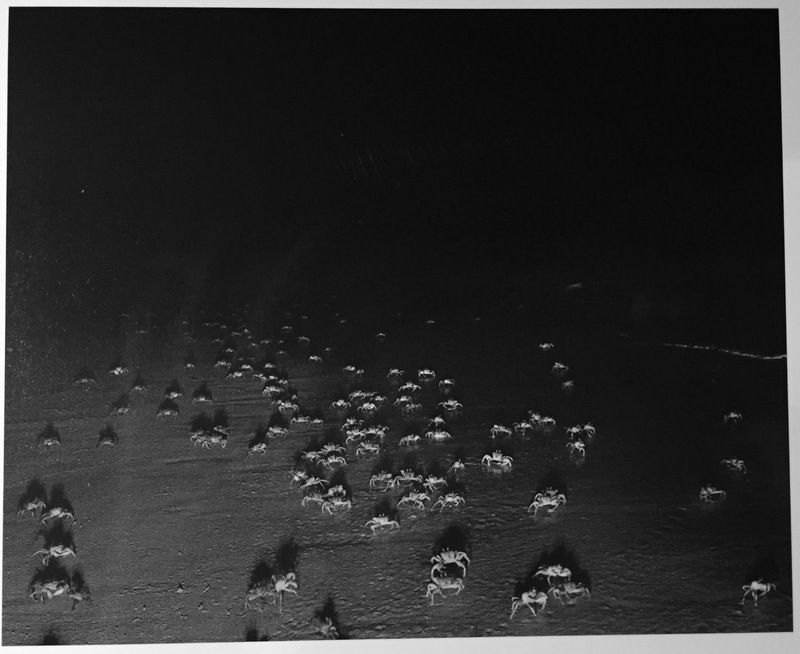 This image of ghost crabs instantly changed the way I feel about the flash kits I have. Parke’s image has me itching to get out tonight on Glenelg beach to see how I can use the flash I brought with me. Sorry about the quality of the image – it is a crappy iphone capture of one of the postcards I purchased. Unfortunately, the flash will have to mount onto the camera – I didn’t bring the grouse radio remotes Tom bought me for a gift some time ago – but this is what the weather looked like at 5.30pm and it has only gotten worse! 3. Threatening clouds are often used to dramatic effect. Combined with high contrast, they produce a recognisable style. 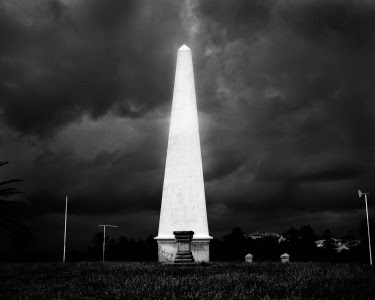 In this image of an obelisk, the sky provides dramatic context. I have to have a look at getting some dark red filters for my black and white photography. 3. Don’t fear the grain. So many of Parke’s images have an ethereal appearance through his embrace of the natural graininess of film, combined with what I would expect to be quite slow shutter speeds. 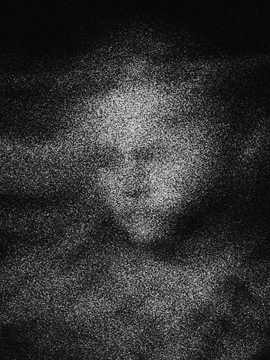 He takes this to the extreme with some of his abstract portraits. There is a lack of sharpness due to the slow lens, combined with the movement of the girl. 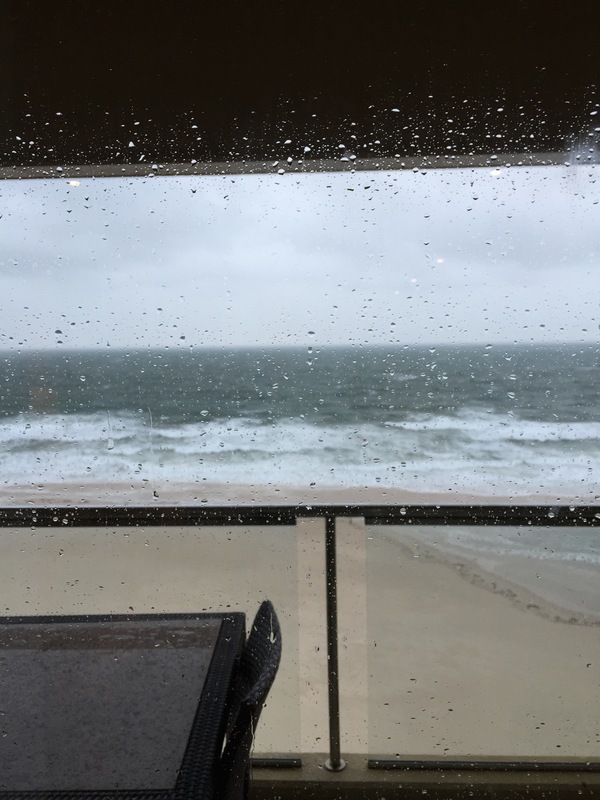 The image is still dynamic and commands attention. Whilst I have removed a fair bit of the grain in post, there is still a bit of a Parke feel about it. Something to think more about? 4. Images belong on photographic paper, not on your computer screen or slick digitally printed photobook… Make the time to go to exhibitions. Print your work on beautiful photographic paper at a professional lab, not K-mart. Enjoy the images. I have been to a few exhibitions of note over the last six months featuring my photographic crushes. Vivian Maier, Ho Fan, and now Trent Parke. I saw many famous images at the Kodak Exhibition in Bendigo a few years ago. Real prints, framed. 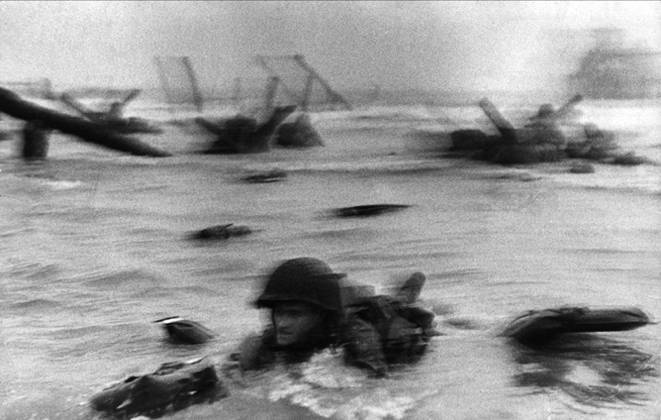 I even saw a print of Robert Capa’s iconic D-Day image which inspired the tone for “Saving Private Ryan” (below). Seeing the printed images completely changes the experience for me. Visiting a gallery to see images helps me be “present” and get the most from them. One of the best (and worst parts) of the exhibition was a kind of scrapbook of Parke’s printed photos with his matching prose. There were two copies on a table in the dim light, for anyone to gently and respectfully leaf through. The printed photos were excellent reproductions and combined with the heavy weight paper, appealed to my analogue tendencies. I have decided to do the same thing at home – print some roughly 8 x 10 prints and mount them using the right archive stuff to a big book. If you want to have a look, I guarantee you will get your own new, clearn pair of cotton gloves to take home and keep as a souvenir. 5. Keep Being Inspired by Other Photographers. I did acquire some very moderately priced Trent Parke loot from the exhibition. (“loot” being a turn of phrase indicating of high value rather than having a five fingered discount applied – of course I paid for the items!). The exhibition catalogue is a handsome, hard back book with most of the images inside – I haven’t yet had time to check for all my faves. $49.95 felt like pretty good value. I am also a sucka for anything packaged in a finicky manner, so I also impulse purchased the box of twelve greeting cards – a bit more expensive, relatively speaking at $24.95. Being able to pull out the cards, sort through them, dog ear them, and love them is just too tempting for me to be able to say “no”. Without books, prints, and visiting exhibitions I cannot learn anything new or be inspired by others. The Exhibition runs from Sat 14 Mar – Sun 10 May, 10am-5pm daily. Get to it, if you can. Despite it being in Radelaide! It’s a great exhibition…..only to be told not to use my camera..hehe…still got a few in. Ballarat International Foto Biennale & Is HDR Just a Distraction?